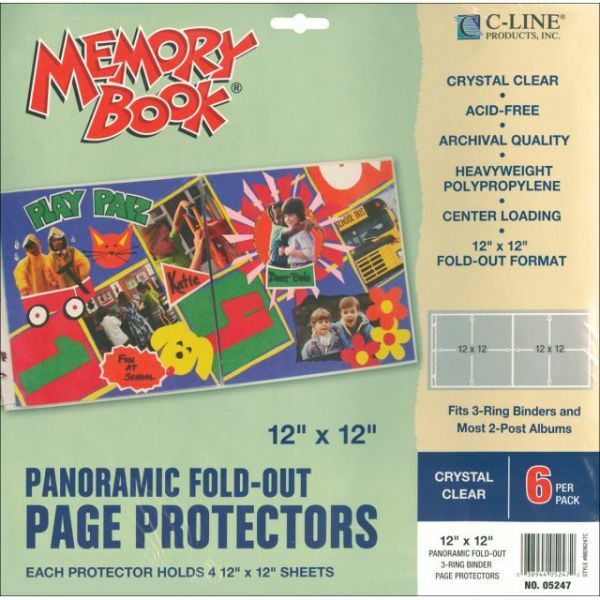 Memory Book Panoramic Fold-Out Page Protectors 12"X12" 6/Pkg - C-Line Memory Book Panoramic Fold-Out Page Protectors. These page protectors have a fold out panel that extend your pages for a panoramic layout. Fits 3-ring binders and most 2-post albums. Made from PVC and acid free polypropylene that will not yellow, transfer ink or stick to photos. Each protector holds four 12 x 12 inch pages. This package contains 6 protectors. Made in the USA.